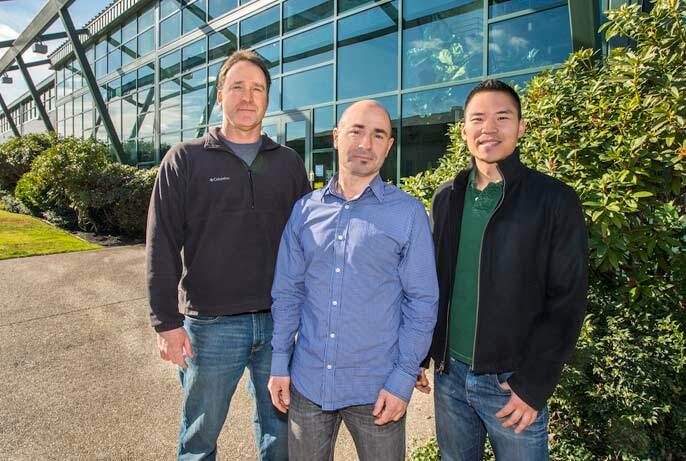 Berkeley Lab scientists Steve Yannone (left), Sylvain Costes and Jonathan Tang helped launch Exogen Biotechnology. Currently, if a scientist or doctor wanted to measure the level of a person’s DNA damage, they would have to look at some cells in a fluorescent microscope and manually count the number of DNA breaks. This kind of counting is labor-intensive, time-consuming, and a highly subjective process. Lawrence Berkeley National Laboratory scientist Sylvain Costes, who has spent over a decade studying the effects of low-dose radiation on cellular processes, came up with a way to automate the job using a proprietary algorithm and a machine to scan specimens and objectively score the damaged DNA. The process was so quick and reliable he decided it should be made widely available. By screening for DNA damage, which is linked to many diseases, including cancer, neurodegenerative disorders, and immunological diseases, Costes and co-founder Jonathan Tang envisioned being able to provide valuable health information to the public. Thus was born Exogen Biotechnology, the latest startup company to spin off from technology developed at Berkeley Lab, a U.S. Department of Energy lab. The type of DNA damage that Exogen measures is known as a DNA double-strand break, where both strands of the DNA double helix are severed. Double-strand breaks are common — in fact, every one of the 70 trillion cells in the human body experiences one to 10 double-strand breaks every day — and your body is also equipped to repair this damage. But sometimes the repair goes haywire, and the strands mismatch, or fail to repair at all. If these cells don’t die but rather continue to accumulate DNA damage and genetic mutations, that can lead to health problems. Tang is a postdoctoral fellow in Costes’ lab who specializes in computational biology and bioinformatics. Their research has focused on the risks of ionizing radiation, especially as it relates to breast cancer and, in studies for NASA, space travel. They launched Exogen with the help of another Berkeley Lab scientist, Steve Yannone, whose research focus is on human DNA repair processes as they relate to cancer, immunity, and aging. They refined their discoveries and patent applications with a $70,000 Berkeley Lab Innovation Grant. With the improved results they were able to start the company with private funds. They are now running an online crowdfunding campaign on Indiegogo and reached their first goal of raising $50,000 in less than 10 days. The campaign allows individuals to get a report on the level of their DNA damage for as little as $99 or to get monthly tracking for $999. Contributors receive a kit to safely collect a small blood sample at home. Their new goal is to reach $150,000 and study a much larger cohort and potentially open the campaign to the rest of the world to compare damage levels between countries. The three tested the concept last year in two trials with 100 people. They found a very strong correlation with age—the older you were, the higher your level of DNA damage. The four people in their trials who had cancer had among the highest levels of DNA damage for their age group. Besides blood samples, Exogen will also be asking people to fill out questionnaires about their medical history and lifestyle. That will allow them to begin to build a picture of how certain factors affect DNA health.